MLA Pesarattu: A variety of pesarattu served with upma is known as MLA pesarattu, which came to be known after it was popular in MLA quarters restaurants in Hyderabad. MLA pesarattu is a favourite in coastal Andhra region especially the Guntur, Krishna, East Godavari and West Godavari districts. MLA pesarattu is eaten both in breakfast and as snack that popular in Andhra Pradesh state in India and is typically served with ginger or tamarind chutney. Dry roast the semolina until the nice aroma comes out of it. Keep aside and let it cool to room temperature. In a kadai/wok, heat the oil on medium heat. Crackle the mustard seeds in the hot oil. Add in the urad dal and chana dal. Fry until the dal’s are slight golden in colour. Add in the chopped green chillies, curry leaves and chopped ginger. Fry for about a minute. Add in 1 ½ cups of water. Season the water with salt. Add the roasted semolina, slowly by stirring it continuously. Cover the wok/kadai and let it cook on low flame for 3-4 minutes. Add in the lemon juice and chopped coriander leaves. Cover the upma with a lid and keep it warm until you stuff it in pesarattu. Soak the whole green gram and rice for 2-3 hours or overnight. Grind soaked green gram, soaked rice with green chillies and ginger in a wet grinder (or mixer) until you get a slightly coarse batter similar to that of dosa batter consistency. Empty the batter into a bowl. Add in the salt to season the batter. Heat a dosa pan on medium heat. Pour a big ladle of batter onto a hot pan and spread the batter in dosa shape. The pesarattu should be slightly thicker than the regular dosa. Pour about 1 tablespoon oil over it. Cook the pesarattu on medium-low flame until you see brown/red patches. Mean while mix finely chopped onions, ginger, cumin seeds and green chillies. 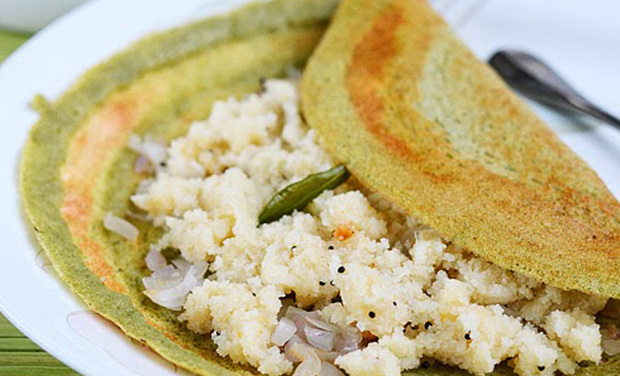 Sprinkle the onion mixture evenly over the pesarattu and place a ladle of upma on one side. Fold the pesarattu from two sides or three sides like we get in hotels. MLA pesarattu is ready to be served. Serve it directly and do not drop them in hot boxes. It should be served on to the plate immediately to enjoy the flavour and crispiness of the MLA pesarattu. Serve hot MLA pesarattu with ginger chutney. If you have any queries regarding the MLA Pesarattu recipe, please leave a comment.